Keynote at Intranets2014 in Sydney | Stupid **** system! I will confess to being a bit nervous before my keynote – ”The digital workplace: how to avoid Parkinson’s Law and Bureaucracy 2.0” – at the Intranets2014 conference in Sydney. 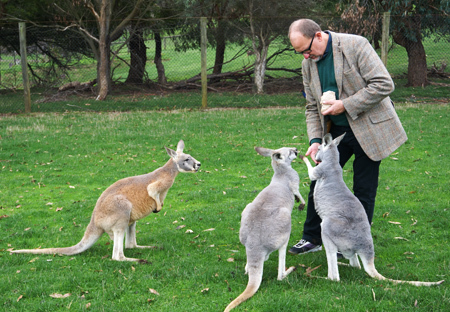 Would an Australian audience recognize the dilemmas I was to speak about? Would they buy the assumption behind the talk: that we have a certain right to demand that the place we work should be decent to humans? And that we have a right to have our say, also in the workplace? These are fundamental European, perhaps Nordic, values. In many parts of the world – the US, for example – I suspect they just would not make sense to many people. Executives and owners rule; end of story. If you’re not happy, clear your desk. What I realized was that Australia share many fundamental values with Europe (as evident by public health care, public transport, trade unions, etc). It was also clear that the trend of more and more command and control, documentation and administration is strong in Australia, too. And the country has been hit hard by several stupid digital systems. For example the Myki public transport ticket system in Victoria or the federal payroll system fiasco in Queensland. And troubled – seriously troubled – attempts to implement digital solutions in health care (more in an upcoming blog post). So the response from the audience was quite good, both in the room and on Twitter. Instigating the masses at the Intranets keynote in Sydney. Photo: Rebecca Jackson/StepTwo. Det här inlägget postades i Events and conferences och har märkts med etiketterna australia, intranets, steptwo. Bokmärk permalänken.